The one thing on this global tour that is pouring out of the seams is just how much the United States is seen as a dictator & bully to the rest of the world refusing to respect territorial jurisdiction. In every country I have visited, I have been embraced as an American Political Prisoner. Everyone can see we bought portfolios in Japan and Japanese companies were bleeding out of their eye sockets rather than being flush with billions in cash to speculate in hedge funds. The changing of transcripts by the judges has exposed to the world just how corrupt New York really is which is why the Facebook suits around the country were usurped and taken to NYC where the judges will protect the investment bankers involved. Because of this status, the discussions are even more frank than ever before. The audacity of the USA to threaten to seize any assets of a foreign company who does not report what an American is doing overseas is the greatest threat to international law since the days of Black Beard & Pirates. I met a European who was married to an American who inherited money from her family and because she is American, no bank will accept her money despite the fact that she has lived in Europe for nearly 20 years. Americans have been thrown out of everywhere. Hedge funds will no longer deal with Americans even living in Europe. The damage to international capital flows is off the charts. This single law has wiped out whatever international trade advantages Americans once enjoyed. This law has inspired real resentment of the United States internationally. Even Americans with safety deposit boxes in Switzerland were given 3 days to get out. There are no Americans left unless they have work permits. American Express will not issue a card to an American outside the United States without work permit status. USA policies of making everyone wait 1.5 to 2 hours at airports just to visit on a business trip and finger-printing travelers is way over the top. A old friend of mine was visiting from Canada. I went to pick her up at the airport. Immigration call me on my phone and asked if I spoke french. I couldn’t believe what they were doing. When I said she was Canadian, the response was she was still an alien. The lowering of $10,000 to $3,000 as the reporting threshold on bank wires is just insane. We tried to wire funds to simply pay for the Bangkok WEC and the bank refused to accept it worried that they would have to prove that we were really just paying expenses rather than trying to hide money offshore despite the fact it was someone else’s account. Trying to do business internationally for Americans is becoming a real nightmare. The once land of the free & home of the brave has been transformed into George Orwell’s 1984 nightmare squared. Americans are now just economic slaves – property of the state no matter where they reside. Americans are being forced to resign citizenship just to survive. Americans have become the most detested internationally as well as the most oppressed economically. You have no right to even resign your citizenship for they view you as the property of the state and they are entitled to future income even if you leave. Only Americans and Japanese are economic slaves taxed on worldwide income, not because you owe a “fair share” of services you receive, but because you were born as property of the state. This attitude is contributing to the Decline & Fall of the United States and indeed China will surpass the US as the Financial Capital of the World.In Asia, the US is becoming secondary as 40% of China’s imports are from Asia as a whole. China has been buying up farms in Australia. They are pushing for their currency to be considered reserve status in Asia. While the US portrays China as corrupt in America they are just given titles – “lobbyists”! As for China violating human rights, just look at the Occupy Wall Street Crowd. The US never locks you up for what you say, they have 1 billion laws available to arrest you for something else.Freedom of Speech is an illusion. In our own case, we have documented written evidence that the government wanted Princeton Economics silenced. When another company wanted to rent the operation to keep the staff in place and the forecasting going, the Receiver Alan Cohen and Tancred Shiavoni of O.Melveny & Myers said they did not care if they offered $50 million in rent per year, the Institute would be closed unless I turned over the source code to the computer model over to them. The pepper spraying of students who were sitting down in protest is an illustration that America does not practice human rights any more than any other authoritarian government. If they do not like what you are saying, they will also take action under the pretense of some other law. 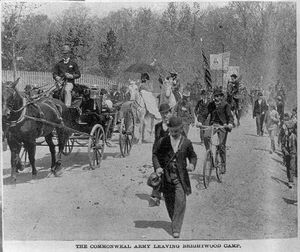 Coxey’s Army that marched on Washington due to the Panic of 1893 was broken up by arresting the leaders for walking on the grass. This was the march that was the inspiration for the Wizard of Oz complaining about the austerity of the gold standard (yellow brick road) and the Off to see the Wizard was Congress with the tin man being industry, the scarecrow agriculture, the cowardly lion was William Jennings Bryan. The veterans who marched on Washington during the Great Depression were attacked by US troops that even killed children and saw US tanks rolling down the streets of Washington, DC. 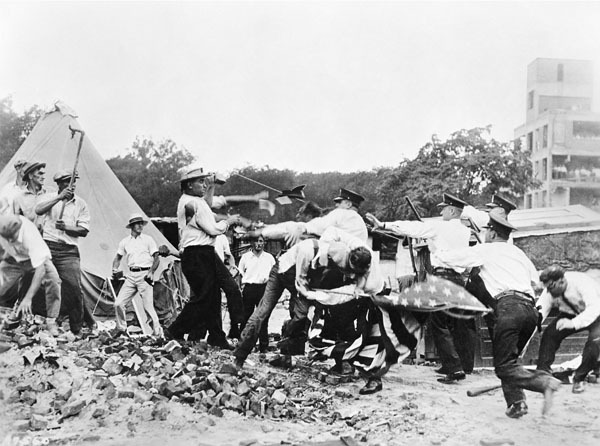 They were known as the Bonus Army and the abuse they suffered forced the government to issue the GI Bill for World War II because no one would trust their empty promises anymore. Now, even China has refused to buy US government bonds from NY bankers. The sun is setting very rapidly and the more power handed to the bureaucrats, the more rapid the demise of the United States will be. Yes it could be stopped. We need serious political reform and clean up the corruption. Even Edward I of England was forced to sack all the judges because of the abuse of legal corruption. Thus – history repeats continually. This is part of the cycle where capital is starting to move away from PUBLIC investment and into the PRIVATE sector. But as long as the American press refuses to address the real issues, then nothing will change. Even respect for the American press has diminished worldwide. Here is a piece in the Guardian showing the undertone of the lack of respect that is centered around the USA press. Is it any wonder why we are in a PRIVATE wave with confidence shifting away from government? This is the catalyst that will force political change but not until the economy forces the issue. We are in the last stages of the collapse of Marxism. That began in 1989.95 and it should be a 26 year decline meaning 2015.75 is indeed where we may see the strong rise of a new third party movement based at last on economics rather than social issue nonsense. For in the end, two guys will be sleeping on a park bench after losing their homes and families. One will say – at least the gays can’t get married. The other will say – well those rich bastards can’t take their money overseas anymore. Sometimes we burn down the barn to get the mouse.